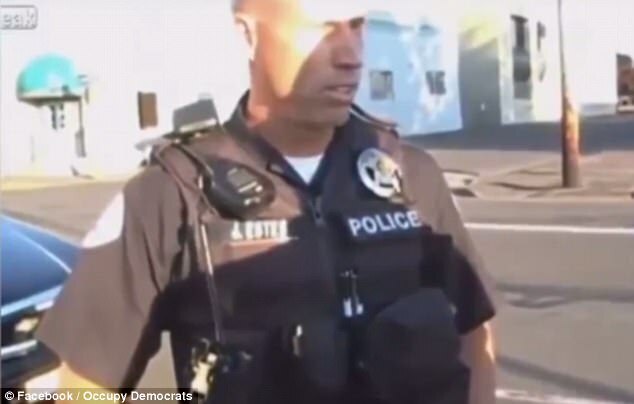 A social experiment has shown how police react to a white man and black man legally carrying an assault rifle along an American street. 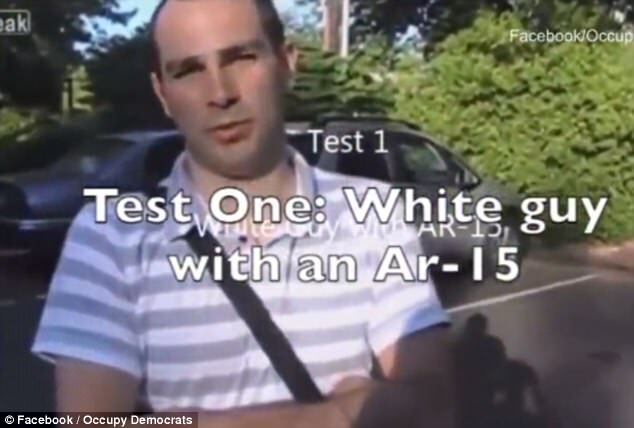 In the film by left-wing political organisation Occupy Democrats, a white man is seen carrying a semi-automatic AR-15. A police officer then approaches the man, named as Warren at the start of the film, and asks to see his ID. When he refuses the cop asks him why he is carrying the gun, to which he says: "I'm just walking around, am I not allowed?" The officer replies: "Of course." The film then cuts to a black man carrying the same gun down a street. An officer is seen pulling up in a police car and exiting his car. He then pulls out a gun and shouts at the black man to "get on the floor". After 30-seconds another two police officers arrive. The officer continues to aim his gun at the man as a colleague is then seen to approach him. 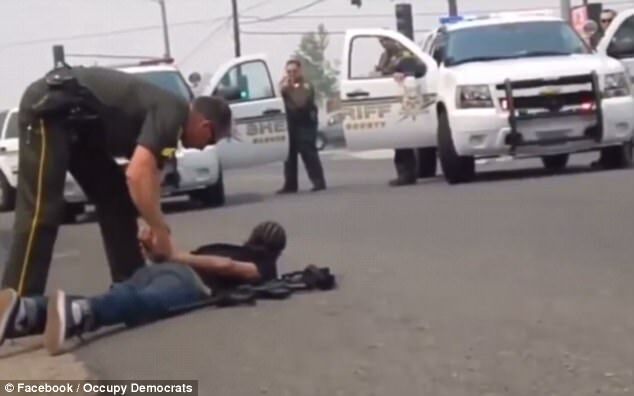 He then unclips the black man's gun and places his hands behind his back before carrying out a search and then leading him away as the gun remains laying on the ground. Another police car arrives, and an officer walks and picks up the unattended gun. American Federal law does not restrict people from carrying guns around in public. However, most states have either prohibited or strongly regulated laws surrounding 'open carry', but most have weakened their laws in recent years. Thirty one states allow the open carrying of a handgun without any license or permit, although in some cases the gun must be unloaded. Fifteen states require some form of license or permit in order to openly carry a handgun. The two-minute film has been viewed more than 8.2 million times on the group's Facebook page . Occupy Democrats was founded in 2012 by twin brothers Omar and Rafael Rivero to provide a "counterbalance to the Republican Tea Party". 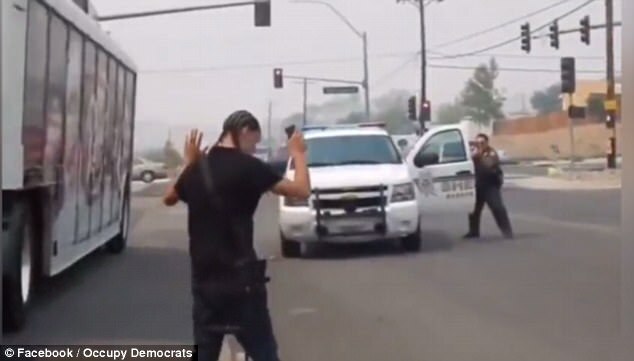 Amongst the 15,000-odd comments, Christine Brucell said the "dude is damn lucky that cop didn't shoot first, you guys are crazy doing this with cops". Dustin Reals added: "The point is it's an open carry state which means cops are well aware that people can legally open carry." But Karen Anderson said she hated open carry for "any person". "It is intimidating and is scary for myself, colour wouldn't matter, the frigging big gun would," she wrote.